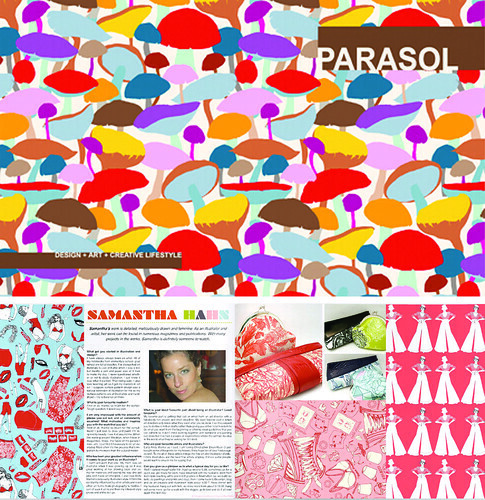 So excited to announce the launch of Parasol Magazine and blog. It’s a Design, art, and creative lifestyle magazine, um… my favorite things. Yasmine Surovec of a print a day was getting up to 2 hours of sleep a night so she decided to launch, edit, and publish her own free downloadable magazine in addition to working as a surface pattern designer and blogging new designs daily on her fab blog. The first issue of Parasol is amazing. It’s full of fabulous art and interviews with some of my favorite artists including Christopher David Ryan and Jessica Gonacha. I’m so happy and honored that Yasmine included an interview with me and her favorites of my surface pattern designs. Check out the issue *for free* here. Did I mention it’s “FREE”? I was just looking for something to read during my break. Oh good! Glad I could point it out to you. It came out like 3 days ago which is like 4 lifetimes in the blog universe! Yasmine did an amazing job. Congratulations on being featured!!! Well deserved. thanks Yoli!! Yasmine and I mutually admire each other’s work. I was honored to be in her first issue. congratulations! the magazine looks awesome. Yes, it’s great. Yasmine did an incredible job. She’s so talented. I can’t wait for the next issue.